Tropical Bass is the exotically invigorating fusion of electronic beats and Caribbean percussion. With a healthy load of feel-good-vibes, Max RubaDub from RubaDub Blends starts off the night. Dancehall and moombahton tunes will heat up the dancefloor from the very beginning. The ‘main dish’ of the evening will be served by WILDLIFE!. 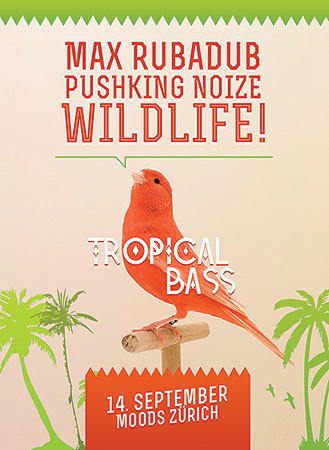 It is his Tropical Bass repertoire which will turn up the heat on the dancefloor a few degrees. 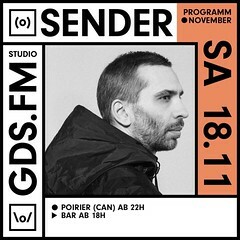 This internationally renowned DJ will refine his set with hints of Global Bass, Ghetto Tech, and those up-and-rising Tropical Bass genres that possess the peculiar bass of techno, but still offer the dance-ability of Raggaeton. Despite this seemingly unholy union, there is no way not to shake your booty to those beats. If you are still willing and able to dance is in for a treat. Pushking Noize will cook up a delicious dessert, an enticing mix of tropical Deep House. There is no second to him in making 4-on-the-floor beats as exotic and danceable. Only in the night of September 14th you will be able to dance beneath the tropical sun in Moods.